How to remove blogger navbar - if you are using blogger's default blogger template then you might noticed a navigation bar at top of the blog. and now if you are looking to remove it from your blog then here i gonna tutorial about the same. However, there is nothing any disadvantages of blogger navbar even it could be useful for us because of its features using navigation bar to your blog you can navigate to the home page, search other blogs, as well as there are quick sign in and sign out links available. so, these are advantages of navbar but sometimes it isn't fit with custom designs so, mostly blogger users are trying hide it from the blog. Earlier we used CSS code to hide navbar from the blog but now it's option available officially by blogger so, now no need to go for any other CSS tricks. 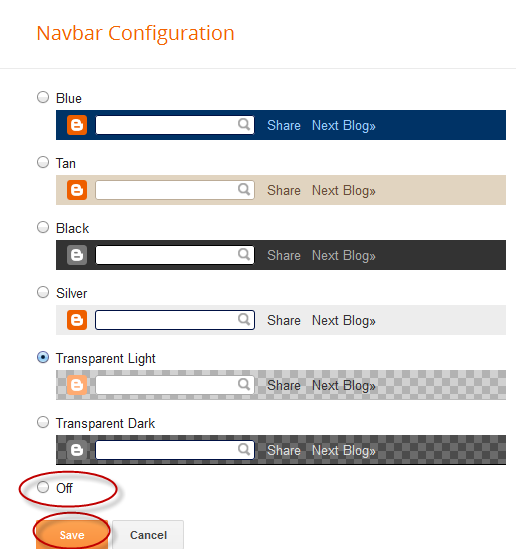 To removing navbar from your blog, you have to follow simple steps given below. STEP : 2 Look for the Layout texts Then click on "Edit"
STEP : 3 When new pop up window appears, scroll down and check "OFF" then save changes.